DEBORAH CROMBIE: There is not much that gives me more pleasure than discovering a new British police mystery series. Add scenic Cornwall to the mix along with strong, quirky, female detective sergeant Morgan Davies, an appealing partner in Scenes of Crime specialist Calum West, stir in great procedural details and a great supporting cast, and you have one happy camper! Author Will North has had a long, award-winning career in writing (more about that in a minute) just not in fiction. I say it's a good thing he got bitten by the fiction bug. I agree wholeheartedly! Here's Will to tell you more. DEBS: Will, we have an obvious kinship here, both Americans writing British police novels. But, oh, my, what different paths we've taken to get there! (And yours is so much more interesting, I must say.) You are a native New Yorker, and from early on a very gifted writer who has had a distinguished career writing non-fiction, some of which is "ghostwriting", or more accurately, collaborating, with some very famous people. Can you tell us a little about that? DC: From non-fiction it seems that you plunged into fiction. Did you always want to write fiction? Was there a particular event in your life that catapulted you into novels? WN: I never thought I had novels in me. I’m not kidding. Not a clue. Then one day fiction showed up uninvited and beat me into submission. Ninety days later, my first novel, The Long Walk Home, was done. Three big New York publishers started a bidding war for the rights. A division of Random House won with a six-figure advance. I thought they were nuts. I still do, despite its success. But yes, something happened to me personally that produced that first novel: my ex-wife but absolute best friend died of cancer. I moved back East and took care of her for the final months of her life. Just before she died, she grinned and said: “I have a surprise for you.” (She was mischievous to the end.) I was to take her ashes to the top of a mountain in North Wales called Cadair Idris and scatter them at the summit. She was part Welsh. It took me a year to let her go but I finally did so. A couple of months after I returned home, it was like her spirit gave me a big dope slap and told me to get to work. That’s how it started. I blame it all on her. Before that, I’d never (knowingly) written fiction, had never even taken a creative writing class. DC: Your first books were in the romantic suspense tradition. (I can't wait to read these, especially the two set in Britain.) Were there particular books and authors that inspired these? WN: Honestly, no. The stories just showed up. The next two novels were Water, Stone, Heart and Seasons’ End (the latter set on the small island in Puget Sound where I now live). I think of them as love stories for grownups about second chances in life, although, yes, there is suspense. I usually have only three things in my head when I start a novel: a sense of place, a couple of quirky characters, and a larger theme I want to explore. Sometimes I don’t understand the theme until I’ve written a good bit of the book. I don’t outline; my characters boss me around and I do what they tell me to. I tell people this at readings and they think I’m joking. I’m not. Every writing day, and I write seven days a week, is a complete surprise. To me, that’s the fun. DC: And then came the crime novels, starting with Harm None, set in Cornwall, featuring police detective Morgan Davies, and crime scene manager Calum West. The question we're always asked, as Yanks writing Brit: What drew you to Britain? And in your case, to Cornwall especially, with your wonderfully rendered settings? And what drew you to start a life of crime? Any writers in particular? WN: Having written those three guidebooks, which involved many long visits over three years with my late wife, I know Britain well, especially the countryside. I am blessed with a photographic memory of “place.” Ten years ago, for example, I spent three and a half months walking through most of southern England, pack on my back. To this day, it is a vivid movie in my head. It was traversing the whole of the Southwest Coast Path that made me realize Cornwall was where my heart was. I am blessed by having a whole team of “advisers” in Cornwall: a recently retired (and somewhat notorious) female CID detective sergeant, a former chief crime scene manager, one of the two forensic pathologists serving there, the head archaeologist for Cornwall, the staff of the Royal Cornwall Museum, the mortuary manager in Truro, several leading pagans and witches, and many others I’ve recruited as needed for each book. I reckon it’s my years as a nonfiction writer that I am so obsessed about accuracy, especially in procedure. I can’t even finish a sentence unless I know the facts are right. I get answers from these folks overnight and am so grateful that they have become my friends. DC: Morgan Davies is a very strong, very real character; prickly, funny, and driven. How did she come about? DC: What's next for Davies and West? I can't wait to read more. WN: Harm None is followed by Too Clever By Half. In that story Davies & West struggle to sort out how a body comes to be discovered floating, naked, five miles off the English Channel coast. It’s tricky. Pretty soon you think you know what’s happened. But you don’t. I have just finished the third in the series, Trevega House. In this story, a series of increasingly dangerous and malicious events is visited upon a couple and their recently adopted, clairsentient young girl. All three are characters who return from my second romantic novel, Water, Stone, Heart. Readers kept demanding to know what happened to the girl. The answer is: a lot. DEBS: Here's a little more about Too Clever By Half. Naked, anonymous, the body found bobbing in the English Channel five miles off the coast of Cornwall is a baffling puzzle for Major Crimes Unit Detective Inspector Morgan Davies and her Scene of Crimes Manager, Calum West. Davies has no victim to name. West has no scene to investigate. The post-mortem confirms that the shallow wounds marking the corpse are due to torture. Two days later, a woman reports her partner, Archie Hansen, missing. A farmer and Druid, Archie has a secret: while plowing one of his fields he’s discovered an underground chamber holding a fortune in Iron Age gold and silver artifacts. Barely a month later he’s the “floater” found in the Channel. 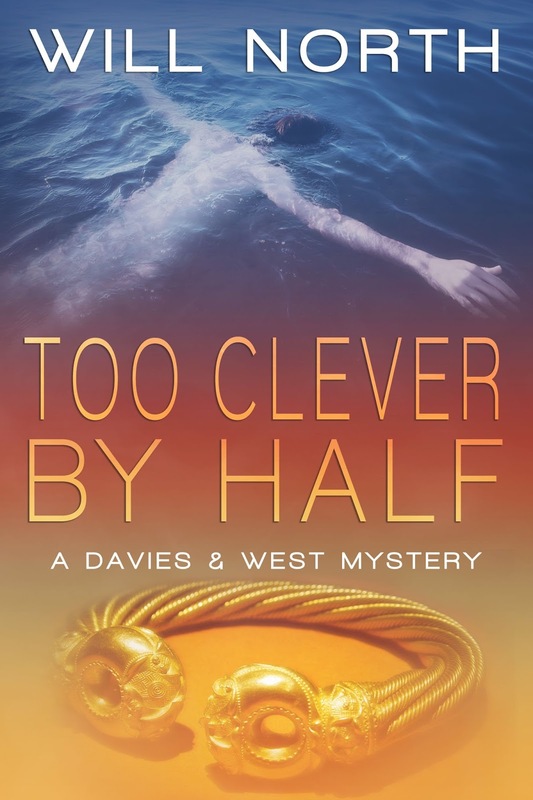 READERS, will be dropping in to answer questions and comments throughout the day, and has a copy of Too Clever By Half (paperback or e-book) for one lucky commenter. So be sure and say "hi." "Will North" is the fiction-writing pseudonym for an internationally best-selling author and ghostwriter of more than a dozen nonfiction books. 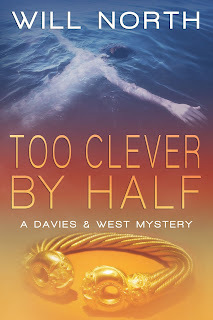 His new novels include ,"The Long Walk Home, "Water, Stone,Heart," "Seasons' End," and the first two books in the Davies & West murder mystery series, set in Cornwall, England: "Harm None" and "Too Clever By Half." The third in the series, "Trevega House," will be released very soon. 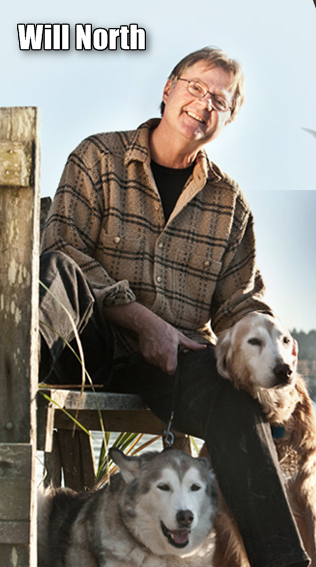 He lives with his wife and various animals on an island in Puget Sound, Washington. You can find him at www.willnorthonline.com and on Facebook at Will North, Author. And JHolden was the winner of Sadie Hartwell's book, if you can email Lucy with your address. DEBS: And, Will, another question from me: Tell us about your gorgeous dogs! What an interesting writing career you've had so far. Do you have a preference between writing fiction and non-fiction? I'm looking forward to reading Morgan Davies' adventures. This is a wonderful interview--thanks Debs and Will! You've done so many interesting things--are you imagining you'll continue on with this series? I love mysteries and have never read Will Norths' books. I intend to add him to my list of 'must read' books. Thank you for this blog. Happy to see you on Jungle Red, Will - Talk about past as prologue! All that travel writing was just research for your career as a novelist! I look forward to reading your book. I adore Martin Walker's Inspector Bruno books about France and anticipate learning about Cornwall in your book. I've been looking for a new series -- I think I've found it! Thanks, JRW, for introducing me to this intriguing series. This sounds so fabulous! (I worked in Washington DC, too, for the Senate Judiciary Committee, and fro Rollin Stone--just a little before your time What an education. I always marvel at how what we do in the past returns to be the perfect thing. What is it about British procedurals that makes them so irresistible? SO great to meet you, Will! The Jungle Red Jungle is a dangerous place for me, because I keep finding more and more writers to read. Everything about these books sounds just my cup of tea, and add to that, what's not to like about a writer in a plaid shirt with two dogs on a dock? Wow! What an interesting personal story you have, Will, and your books sound just as fascinating. I will look for them, perhaps for holiday gifts for some British mystery fans on my list. Hank, I have the same question - I have such a list of British procedurals I fear I'll never read them all. I find your journey to fiction writing fascinating. Is there anything about one you prefer over the other? Cornwall? Absolutely my neck of the woods. We stay with John's sister every summer at her manor house (near Lamorna!) so I really look forward to reading these books. I hope pasties and cream teas figure in the plots! I am looking forward to this series. I love strong female leads. I absolutely love British mysteries, can't get enough of them! I will definitely add Will North to my list of to-be-read authors. What a fascinating journey you have had, Will, to reach this stage of your life. Will, your journey to crime fiction is fascinating. Just this morning on The Writer's Almanac, I head a quote from the poet Sharon Olds: "I was a late bloomer, but anyone who blooms at all is lucky." Sounds like you've had a whole garden, blooming at different times! There is just something about Cornwall that draws one in. I enjoyed the interview and look forward to reading your books! I must admit, of all the interesting things you've done and written about, I'm most intrigued by your writing about/with with dinosaur hunters. I spent many years as a kid rock hunting with my folks--digging fire opals, dry-washing for gold, or collecting some of my treasured rocks just because they had interesting colors or shapes. I love that you started with characters and they formed the story. Such an encouragement for writers finding their path. Your British procedurals sound fascinating, and I'll definitely be adding them to my reading list. This sounds fascinating. A new author for me to 'get involved with'. The author has such a varied background but with a writing skill at his core. Very interesting interview which intrigued me. Now I need to start on this new, to me, mystery series. Thanks for the information. Finding one's "home: is so magical. For my husband and me it was rediscovering Maine after not visiting for years. Now, although we live in south FloWe only get there a few weeks per year, but it's marvelous. Hi Will! You had me at "Cornwall" and "prickly heroine"! Can't wait to dive in! Yippee: I now can look forward to some binge reading with your new series, Will, as well as catch up with your stand-alones. My fascination with British mysteries began with Catherine Aird decades ago and am so happy to have it continue with both the Reds and you. Thanks for starting my day with this interesting post. I am so excited!!! I loved Water,Stone,Heart and Cornwall is an obsession of mine, even though I've never been there. Boscastle, a character in itself, and the other great characters have stayed with me since I read this book in April of 2011. Oh, and the hedge building was immensely interesting to me. Now, I learn that Will North is writing a crime series set in Cornwall, and the reappearance of Andrew, Nicola, and their special girl is something I am looking forward to. So, I have much about which to be excited. A new series set in a favorite setting and a visit with old friends. I have already put Harm None and Too Clever By Half on my Amazon wishlist, thinking these books will be a great addition to my Christmas box of books I give myself every year. And, I've always loved that phrase, "too clever by half." Thank you, Will, for visiting the Reds today and for cheering me up. I was thinking about all of the things around the house I need to do in the next few days and feeling somewhat overwhelmed. Well, that all went out the window when I found out about your Cornwall police mysteries. And, as I am wont to do, I visited your Web page and signed up for your blog, which I encourage others to do at http://willnorthonline.com/blog/ As a blogger myself, I have to check out other blogs, and yours looks so interesting. Also, I'd like to give a shout out to Margaret D’Ascol and Henry Wadsworth Longfellow, thanking them both for your wise choice of career. Arghh. How could I have forgotten to tell you, Will, that your dogs are gorgeous. They are! Just picked up Too Clever by Half today, came home and found this on JRW! Favorite meme recently: a photo of a shopping cart full of huskies with the tagline: "They were having a sale!" That is a great quote, Julia! And SUsan D--so happy you are hooked! Hope I am not too late to say hello and throw myself into the pot for one of these sensational books!! I visited Cornwall once -- in the mid-90s and loved everything about it!! We stayed in an historic hunting lodge, enjoyed cream teas, and searched for King Arthur. Wait a minute! There's a give-away? How'd I miss that? Thank you, Denise Ann! I've haven't been to Cornwall (yet), but I had a pasty or two at Oxford--probably in the covered market up the street and across the High from Tom Gate. I found out later I'd been pronouncing pasty all wrong. I'm still embarrassed! I started eating them when my tutor's admonition came true. "Don't eat the fish and chips from the truck parked outside. You'll get sick." Joan: I much prefer writing fiction. I think of nonfiction as my former "day job." Lucrative but not nearly as difficult or rewarding. Reine: thanks so much for ordering the books. I want critiques from you at willnorthnovelist@hotmail.com. Lucy Burdette: Yes, I have more stories for the series. Hallie: Yes, the travel guidebooks (very quirky and opinionated) filled my head with ideas. It is a bit odd to have a photographic visual memory (the rest of my memory is useless!). Hank: yes, I was a "policy wonk" for many years. Then Reagan fired me and I was set free! So much happier as a writer ever since. And by the way, Hank, I've seen your photo; I sincerely doubt you are older than I am! Mary Sutton: Which of my books to I prefer? My first novel, romance and suspense, "The Long Walk Home," got me into fiction, is very popular, and is dear to me. As for the Davies & West mystery series, I have to say I like all of them and hope the third will be available soon. Oh, and I am sorry to say both those dogs have since died of cancer. I miss them deeply: noble and elegant they both were. We now have four more. NEVER MARRY A VETERINARY TECHNICIAN! Diane Hale: The dinosaur book is "The Lost Dinosaurs of Egypt." It's quite a yarn It's written with my real name, which is "William Nothdurft." And to all you "Reds," thank you for your words. I feel honored to have been "discovered" by JRW! Okay, the Martha Grimes "Lamorna Wink" story: Grimes names her mysteries after real pubs in England. She is a splendid and often hilarious writer. So, the Lamorna Wink is a tiny pub wedged into a narrow valley on the English Channel coast of Cornwall. It's walls are studded with artifacts from Cornwall's history of luring ships to the rocks. The "wink" comes from long ago when Cornishmen brought French brandy, illegally, into their tiny ports. At the pub, where everyone had their own pewter mugs hanging above the bar, a wink would signal a tipple of brandy, rather than ale, invisible to the revenuers watching them. I asked the landlord of the Lamorna Wink whether she knew about the Martha Grimes mystery, and she fairly exploded: "Nothing to do with us! None of that ever happened here!" I tried to suggest that it was fiction, but she'd have none of it.